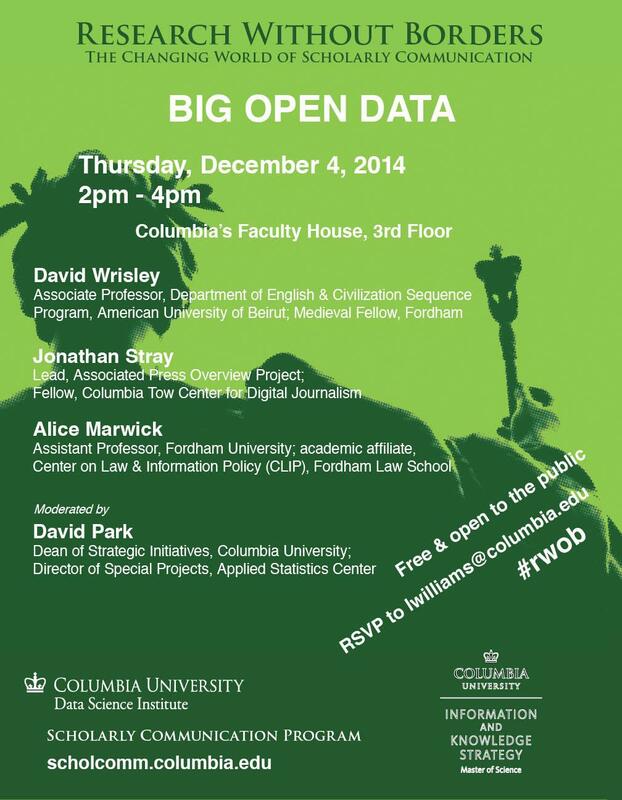 Flyer for Research Without Borders: Big Open Data courtesy of Columbia CDRS’ Twitter. The lone humanist, David J. Wrisley, asserted that his presence at Research Without Borders might have seemed unusual since it was an event discussing data based research. However, he did an excellent job demonstrating the role big open data can play in his discipline by citing several projects, from various areas of study under the humanities umbrella, as examples. For his presentation, he punctuated the topic to emphasize its different permutations: “Big, Open Data,” explaining how these “different beasts” have encroached into the humanities in different ways. Wrisley not only addressed big, open data as simply an issue of “so much data, so little time”; he also discussed ways in which the humanities can change data and computing as well as change the ways we think about these things. Wrisley presented how data-driven projects in the humanities are being conducted by scale and granularity. “Big humanities projects” analyze large datasets to shed new light on traditional areas of research. Conversely, projects using “small big data” study objects by getting extremely close—closer than what can be seen by the human eye. Regardless of the method, Wrisley ultimately advocated for collaboration among scholars. He explained that the use of big, open data is shifting the work of humanists in scholarly communications. Previously humanities arguments would be constructed in singularity and then connected with the academic community through writing. Nowadays, these projects must often be done in teams in order to secure big funding and to protect these works from digital rot. As could be expected after such an unsettling final presentation, during the following question-and-answer session questions mostly reflected concern about data collection online and the dystopian possibilities of big data. There was a discussion on apps such as SnapChat, which claim to be “anonymous.” However it turns out that they do not actually have the type of encryption software necessary to truly be anonymous. One audience member brought up questions of obfuscation and faux data, which can also be used as a form of activism. At one point Stray did assert that the future is not entirely bleak although we will never be able to opt-out entirely because this technology is simply too easy and too useful. Furthermore, Marwick pointed to the strength of the new European privacy laws as a hopeful example. The panel discussion ended with Wrisley explaining the many challenges of interdisciplinary work. To illustrate the importance of crossing disciplines, he referenced a recent conversation with a friend who expressed dismay that, “at the information visualization conference there were 500 solutions to no problems…and at the humanities conference there were 500 problems with no solutions.” Moderator David Park also chimed in stating that despite these challenges, he feels more and more scholars are seeing the value in collaboration. Academic librarians can help to facilitate these valuable scholarly connections among different fields of research in addition to maintaining collections of data and making accessible.